Jack Arthur McCray, an iconic figure in Charleston and jazz impresario who did more than anyone to assert the cultural significance of the music he loved, was found dead Wednesday evening in his Coming Street apartment. He was 64. He died of natural causes, probably Monday night, according to the Charleston County Coroner’s office. He had been coping with some health problems in recent months, friends and colleagues said, and complained recently of a cough and some numbness in a leg. On Oct. 30, his birthday, he was forced to cancel a family gathering because of sudden back pain. “We tried to get him to see a doctor, but he wouldn’t go,” said Leah Suarez, executive director of Jazz Artists of Charleston, a presenting organization McCray helped found in 2008. The program, started in 2003, is just one method of institutionalizing and legitimizing a dynamic music history unique to South Carolina. The initiative has succeeded in archiving thousands of images, documents and recordings that, together, reveal the rich and important legacy of the area. Jazz Artists of Charleston was formed by Suarez and other local musicians, with McCray serving as a rallying point. In late 2007, after years of promoting the growth of live performance in the area, McCray thought that the time was ripe for an institution that could formalize the presentation of jazz and capitalize on the jazz culture he had celebrated for so long, Suarez said. A longtime employee of The Post and Courier, McCray began his journalism career in 1985 as a sports copy editor and writer, became an editor of the neighborhood editions, then turned his attention to arts and culture. He retired from the newspaper in 2008, then went on to become a freelance jazz columnist for the newspaper’s weekly entertainment magazine, Charleston Scene. 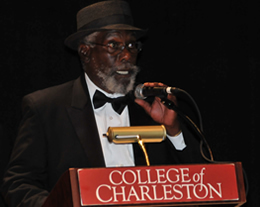 McCray is the author of “Charleston Jazz,” a history of how the genre evolved in the Holy City. Drummer Quentin Baxter first met McCray during a gig in 1993 at the Music Farm. McCray came for an interview and proceeded to ask unusual questions, Baxter said. He was writing not just about a particular gig but about the way that gig fit into the larger matrix of jazz in Charleston. It was a kind of dialectic, an ongoing conversation that helped to motivate local players, Baxter said. Before long, the musicians he supported would be playing regularly in restaurants, bars, theaters and festivals in the city. Born in the Ansonborough neighborhood of Charleston during the Jim Crow era, McCray attended Buist Elementary then C.A. Brown High School, where he played trumpet in the band under George Kenney before transferring to Burke High School. As a teenager, he spent summers with relatives in New York City, an experience that exposed him to a lively cultural scene that would influence his worldview and cement a love for the big city, according to longtime friend and writer Walter Rhett. He attended Claflin College in Orangeburg in the late 1960s and was among the group of students protesting segregation and school policy in February 1968 when state troopers fired buckshot into the unarmed crowd. Filled with fear, and horrified at the bloody mayhem, McCray fled the scene as fast as his feet would carry him, toward the infirmary up the hill, he said in an interview earlier this year. That event would become known as the Orangeburg Massacre. Married in his 20s, he and his wife Sandra had two children, Terry and Krystal, before separating. In the years that followed, McCray would cultivate long-lasting relationships with people of all stripes, advance his love of music, and advocate on behalf of young people. He was essentially a cultural anthropologist determined to show the connections between music of different regions, and between music and cultural identity. When Osei Chandler (no relation to Karen) moved to Charleston from New York City in 1977, McCray was one of the first people he met, and the two men forged a lasting friendship. Chandler soon was on WSCI radio hosting the Wednesday night Jam Session, a program devoted to jazz. McCray helped, sometimes acting as co-host. When Chandler was offered a second show, to feature Caribbean music, McCray began co-hosting more often, and eventually took over the jazz program, Chandler said. The two men were on the air together several weeks ago for Chandler’s current reggae show called Root Music Karamu, and McCray lately had been expressing an interest in returning to the radio as a regular host, Chandler said. In 1981, they started a soccer team called the Little Peles, which was part of Charleston’s youth soccer association and meant to provide urban black children a chance to play the game. Chandler was president and head coach. McCray, too, was a coach, and later a referee. “He was probably the first black soccer referee in the state,” Chandler said, setting an important example for young people. The team won the state championship that first season. At about the same time, McCray’s interest in advancing the cause of jazz was crystallizing. A 1979 jam session in the Green Room of the Dock Street Theatre led to a slot in the 1980 Piccolo Spoleto Festival. The series — 14 events in 10 days — was called “Jazz After Hours.” Many people guessed it would flop, but patrons lined up around the corner of Market Street waiting to hear innovative jazz, co-organizer Osei Chandler said. Mayor Joe Riley called McCray a lost “treasure” and his death a loss for the community. “He was such a fine, friendly, happy, genuinely nice person, with a wonderful smile that was genuine and spirited and nourishing for anyone who came in touch with him,” Riley said. The Jenkins band produced musicians who played in Charleston and who went elsewhere, taking the local jazz sensibility elsewhere to influence others, he said. He was a visionary and optimist who, decades ago and despite many obstacles thrown in his path, dared to imagine a Charleston cultural landscape at the center of which proudly stood jazz, she said. Rhett said the notion that music and community are inseparable is at the core of McCray’s philosophy. In jazz, Rhett said, musical expression depends not only on sound. It requires silence, too. It requires a space in which sound and energy, wit, love and joy can swirl freely. “Jack’s death is the ultimate space,” he said. Funeral arrangements are being handled by Harleston-Boags Funeral Home.